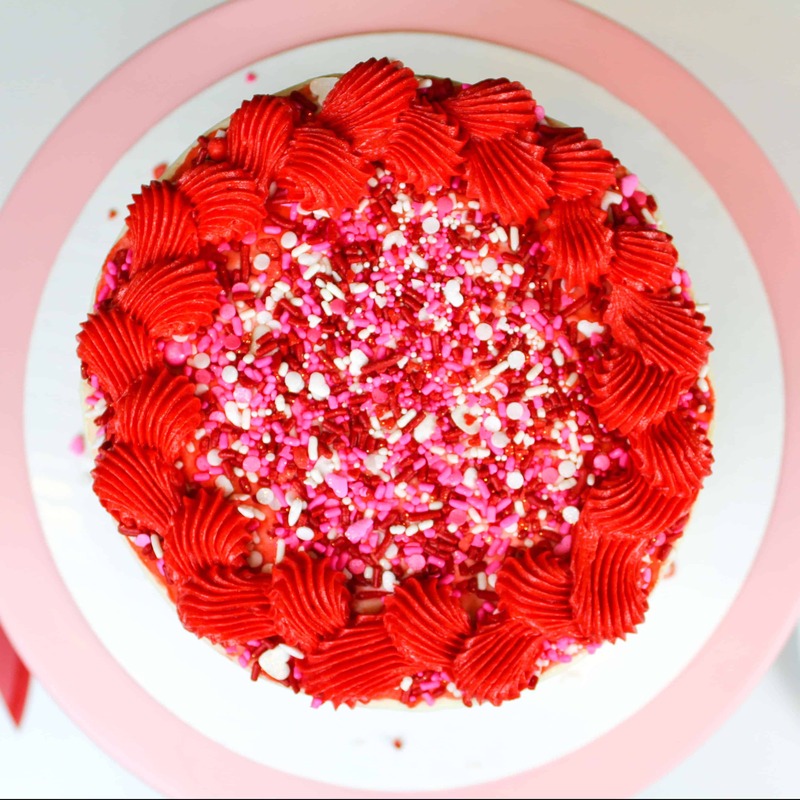 I’ve started sharing my Valentine’s Day cakes across social media, and a few of them are decorated with super vibrant, red buttercream. 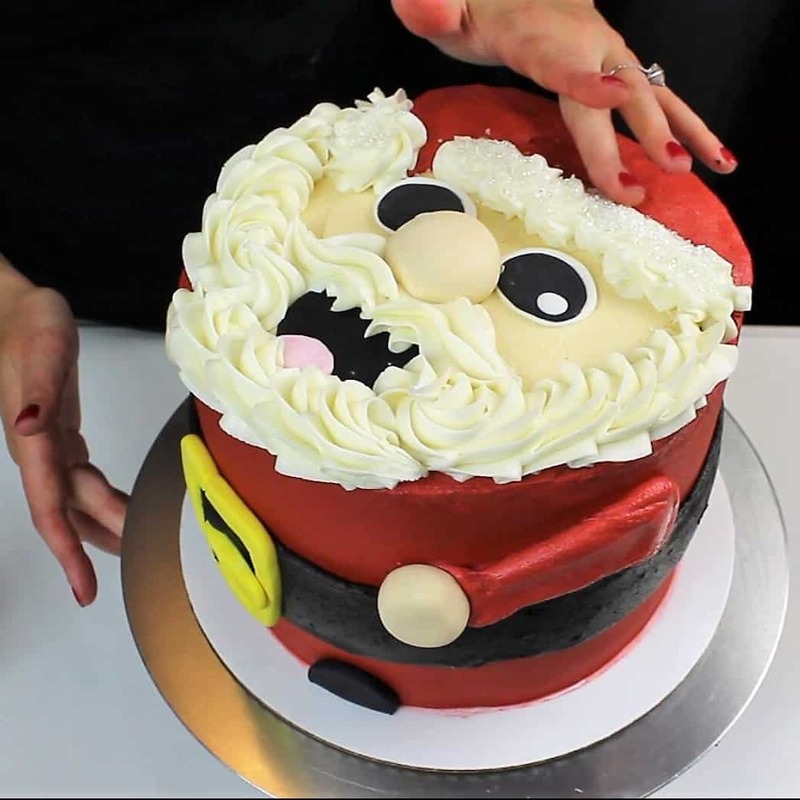 This has to led to tons of comments and messages asking how I make such red frosting! There are a few tips I have to make frosting that is a deep, true red color. The first is to use gel food coloring or powdered food coloring! When it comes to coloring your frosting, these are an absolute must. Liquid food coloring can throw off the consistency of your icing, especially if you have to add a ton to achieve the color you’re after. Gel food coloring is much more concentrated, so you can add less and still get a deep color. The brand you use can affect the color too, as some are more true to color than others. I always use the Americolor brand (not sponsored, just my very favorite food coloring)! I like to use the super red shade when making red buttercream. Powdered food coloring is less commonly used, but is another wonderful way to get a bright red frosting. This red powdered food coloring isn’t expensive, and you can order it on amazon. The biggest benefit to using it is that it has NO bitter aftertaste. There also are some wonderful natural red powdered food colorings. If you’re looking for a natural way to make red buttercream, I suggest going this route. Most of my cakes are frosted with an American-style buttercream frosting. My frosting is naturally pretty white, which makes it a great base to be colored! If your frosting is somewhat yellow, this can make it harder to make brightly colored frosting. My second trick to making red frosting is to make it in advance. Yes, time is another secret!! If you make the frosting a couple days (or more) in advance, the color of the frosting will deepen over time. This buttercream can be made over a week in advance, and store it in the fridge until I’m ready to use it. While we’re on the topic, I have one important piece of advice around making frosting in advance. As buttercream sits and/or thaws, it usually gets tons of tiny air bubbles in it! When you make frosting, it’s almost impossible not to incorporate air into it as you mix in the powdered sugar (I recommend using a paddle mixing attachment to help minimize this). This becomes more noticeable overtime as the buttercream sits, and tiny air bubbles form. To make your buttercream smooth again, all you need to do is give the frosting a really good stir with a rubber spatula. Work the frosting slowly from side to side, and spread it across the sides of your bowl for a few minutes. It’s definitely an arm workout, but after working the frosting around the bowl and pushing out the excess air, you’ll be left with silky smooth frosting. My final tip helps manage the bitter flavor that bright red buttercream usually has. I am the first to admit that most frosting made with lots of food coloring tastes bitter. Red frosting is one of the worst offenders, and there are a few ways around this. The first option is to use a “no taste” red gel food coloring, which helps reduce the bitter aftertaste. It’s harder to find online, and while it does make the frosting taste better, there still is a tiny bit of aftertaste. Like I mentioned above, another great way to avoid bitter taste is to use powdered red food coloring! It works great, and you can’t taste it at all!! My way around this is to flavor the frosting, either with a strong extract (like almond or coconut), or with cream cheese! I love using my cream cheese buttercream recipe when making red frosting. The cream cheese flavor helps counter the bitter taste of the food coloring. My cream cheese frosting is thick enough to pipe with, and is what I used to make this red buttercream rosette cake. My final trick to making red frosting is to start with a pink frosting. Strange, I know. But pink food coloring doesn’t have the same bitter taste that red food coloring does. It’s way easy to turn pink buttercream red than to start with a white buttercream base and make it red. It also allows you to use way less red food coloring, which I think we can all agree is the goal here. Whether you’re making a cake for Christmas, Valentine’s Day, or an angry birds cake, I hope these tips help you make the brightest, most delicious red buttercream!! If you try this red frosting recipe, please tag me @chelsweets. Also use the #chelsweets so that I can see your amazing creations! If you have any questions about red frosting that I didn’t cover, or if you have any tips of your own, please share them in the comments section below. Struggle to make truly red frosting?? Learn my tips for making the brightest red buttercream, with a simple recipe that comes together in minutes. Add in a generous squirt of gel or about a 1/2 tsp of powdered food coloring once the frosting is fully made, and beat on low until it reach the desired colored. So how much Americolor gel food coloring do you use for a single batch of frosting? And do you only add red, or do you add other colors to deepen the color? I heard buddy valastro (cake boss) say he uses a bit of vinegar to take away the bitterness of red food coloring! 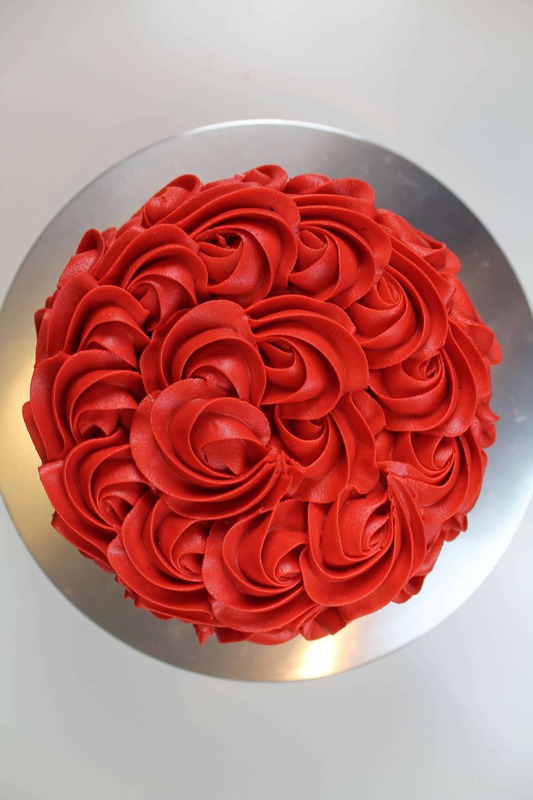 What tip did u use on the red cake to make the round swirls? I’ve always noticed how colored buttercream gets darker over time, but I’ve never thought to use that as an advantage! How do you store your buttercream? Whenever I out it in the fridge, it tastes like the fridge later on ?. after a day or two you should know! If it’s still pink, you can try adding in a tiny bit of black, or you may need to try a different brand of gel food coloring! thank you! i actually just added more red, i dont think I originally added enough lol, I do have to also thank you for all your tips, they helped me tremendously and made making cakes fun again instead lf stressful, thank you thank you!! 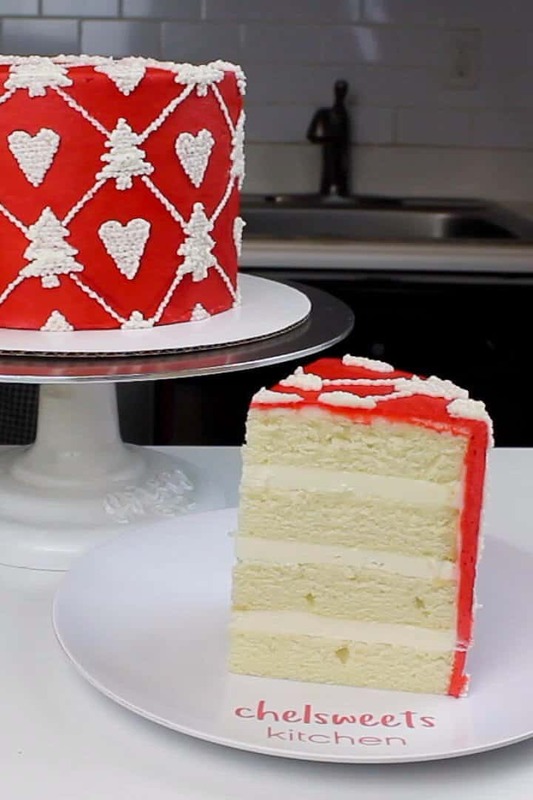 Can such bright red color be achieved using heavy whipping cream for icing. Which color and brand would you recommend?